The following article appeared in the Winter Visitor Guide 2008 for the Colorado River Communities & Imperial Valley. Doug Baum of the Texas Camel Corps in a typical summer uniform worn by Lt. Edward F. Beale’s soldiers, if they wore a uniform at all. If the first sailing ships, the first horses and the appearance of the first Caucasians – Spanish, French, English and Portuguese – flummoxed the natives in the Caribbean and in the Americas – imagine what the sight of a camel 150 years ago must have been like. “Here the Indians began to pour in upon us from the Mohave villages. First, two or three, and then by dozens. They were a fine looking, comfortable, fat and merry set; naked excepting a very small cotton cloth around the waist, and, and, though barefooted, ran over the sharp rock and pebbles as easily as if shod with iron. The concept of using camels as pack animals was promoted by Sen. Jefferson Davis when he became Secretary of War in 1853, the idea implanted in his imagination five years earlier by a Major Henry C. Wayne. Davis, who later assumed the presidency of the Confederate states, was forward-looking on behalf of the South – he was interested for economic and political reasons in seeing the South connected to the newly-acquired State of California. He favored the Gasdsen Purchase, for example, to expand lands of the Arizona territory for a southern railroad route to California. “While with Kit Carson in an exploration of Death Valley, California, Beale had conceived the ideas that the camel, would solve the problem of conquest of waterless wastes in the desert. In fact 79 camels were purchased from the Middle East and shipped to Indianola, Texas, halfway between Galveston and Corpus Christi, then on to Camp Verde, Texas, near San Antonio. A word or two about Lt. Beale, who by the time he was 28 years old, had traveled across the country 10 times. 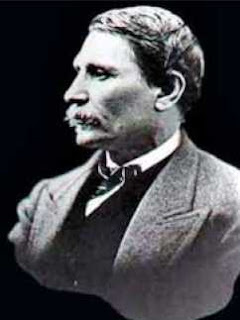 Born in 1822 in Washington, D.C., Beale was the their way though hostile lines to San Diego for reinforcements, in time to save Kearney’s troops. Beale made six more trips across the country in the next two years, including a trip in 1848 where he carried proof of the discovery of gold in California and was instrumental in starting the Gold Rush of 1849 to the Golden State. In 1853, Beale was appointed Superintendent of Indian Affairs for California and Nevada, and that year, he made another of his cross country journeys, evaluating a railroad route through southern Colorado and southern Utah. He made his home at Fort Tejon in California, near Bakersfield. It was in 1857, then, that Beale was simultaneously appointed to survey a wagon route between Fort Defiance, N.M. and the Colorado River, along the 35th parallel, as well as to take command of the first – and last – U.S. Army Camel Corps. The expedition embarked from Camp Verde at on June 25 of that year, a party of 44 men; 12 wagons; 95 mules, horses and dogs; and 25 of the 70 camels that had been imported. “Left San Antonio at 1 p.m., and encamped at the beautiful spring at San Lucas, having made sixteen miles, the camels carrying, each, including pack saddles, nearly five hundred and seventy six pounds. The Camel Corps proceeded through the Big Bend Country of Texas, stopping at Fort Stockton, the on to Albuquerque, then to Fort Defiance. Though his contract called for him to begin the survey at Fort Defiance, it actually was the Zuni Pueblo in Zuni, N.M. just across the northeast border of Arizona, that Beale began his assessment. Traveling west across Northern Arizona, much of which would later be Route 66, the expedition used the San Francisco Peaks north of present-day Flagstaff as a guidepost as they headed west. And the camels began to outperform the mules, once they became accustomed to the daily grind of the trail, and carrying as much as a half a ton of supplies was a standard load for the good-natured beasts. The expedition’s journey ended on Oct. 18, at Beale’s Fort Tejon home. 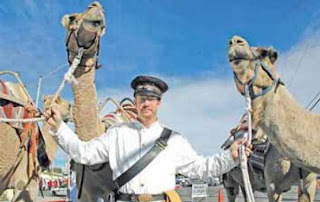 With the outbreak of the Civil War in 1861, interest in camels as a mode of transportation was put on hold until after the war. While Beale as convinced of the animals’ utility, soldiers and cavalrymen were not, for they considered the animals malodorous and difficult to handle – the latter assessment contrasting to the experiences of the 1857 expedition – compared to the behavior of mules. President Abraham Lincoln pushed for the completion of the Transcontinental Railroad, and rail became the preferred method of handling freight and the mails. The camels at Fort Tejon were taken to Los Angeles, where they hauled freight to and from the harbor’s docks. Those back at Camp Verde went to auction and ultimately carried freight or traveled with circuses. Some camels were used in Western Arizona to carry goods across the desert. There were camels introduced from the Orient that ended up on Northern Nevada. 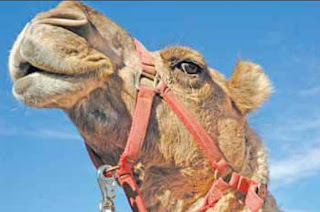 Many camels were simply turned loose, leading to reports that remained unverified as late as 40 years ago that descendants had been spotted in remote areas. And what of the wagon road survey that Beale conducted, between Zuni and the Colorado River? Beale wrote to Congress that “… one may travel the road in winter and summer withough suffering the extremes of heat or cold,” providing charts of the summer and winter temperatures along the way, as well as faithful odometer readings. Where there were canyons, washes for rivers, he suggested either bridges or diversion dams, depending on the situation, to straighten elbows that the party was forced to take from time to time. His estimate of cost: $100,000. He stated: “As this will inevitably become the great emigrant road to California, as well as that by which all New Mexico will reach this place, it is proper that the government should put in it such a conditjion as to relieve the emigrant and stock drivers of as many hardships incident to their business as possible. “I presume that there can be no further question of the practicability of the country near the thirty-fifth parallel for a wagon road,” he stated. It wouldn’t be until much later that this became U.S. Route 66, and emigrants found many ways to get to the West Coast – by vessel around Cape Horn; the Butterfield Stage and rail through Southern Arizona and over Yuma Crossing and the Ocean to Ocean Bridge; and the Oregon Trail, to name a few.